8,8 Richer Earthquake hits Japan on East coast of Honshu. Over 80 afterquakes with a magnitude of > 5.5 Richter occurred within 48 hours of the major 8,8 Richter Earthquake of March 11. 2011. The occasion does bid for the opportunity to testing of a thesis regarding afterquakes, as has been observed and demonstrated in previous large scale earthquakes. The test involves monitoring for a significant alteration in the pattern of afterquakes, which in this instance involves either an afterquake in serious excess of previous afterquakes measured in the region of 5-6 Richter ( A 7 Richter scale sized earthquake may qualify), or that the intensity of afterquakes fades to once again spike at the time specified. The impact of the 8,8 Richter Earthquake of March 11. 2011 is so vast and significant that is rational to monitor the 45 day interval, as demonstrated in previous earthquake patterns, for the potential of future major seismic events. This simple mathematics highlights April 25. as a first potential and rational date for forthcoming tensions, but these tensions would not seem to relate to the area as Japan, as events seem to travel - as shown in previous examples. Note: Earthquakes tend to appear and move as families, but it does not imply by necessity that one pattern or model of likeness observed in one family automatically may be transferred and applied to another seismic sequence. 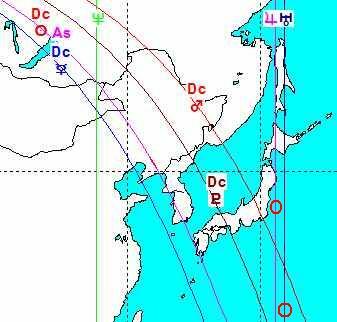 Meridian lines with reference to the exact minute of longitude for the epicenter of the two major Earthquakes were highlighted in maps for the lunar eclipse of Dec 21. 2010, and quoted at Skyscript.co.uk on Dec 9. 2010. The build-up in the area was first noted in the chart of the New Moon of Nov 6. 2010. The disaster zone was also high-lighted in the chart of the New Moon Feb 3. 2011. In above chart Earthquake epicenters have been inserted and marked by red circles. The Lunar eclipse on Dec 21. 2010 occurred at 06.11 GMT. The 1st Earthquake near Bonin Islands (7,4R) occurred 11 hours 8 minutes later (less than 12 hours) at 17.19 GMT. The 2nd and largest Earthquake (8,8R) dated March 11. 2011 occurred at 05.46 GMT, which is close to an exact 80 days after the Lunar Eclipse, or 79,5 days after its companion Earthquake. The event-line travels 11°28' North over a time interval of approximately 80 days. 11°28' comes close to 12°, which is an expression of 1/30th of a 360° circle.